The Deep Carbon Observatory is extremely grateful to the Alfred P. Sloan Foundation for awarding grants that provide continuing support for the Extreme Physics and Chemistry and Deep Life Communities. We have great confidence in the continued success of both Communities as indicated by recent publications and results presented at an Extreme Physics and Chemistry Community Workshop at Arizona State University on 4-5 November 2017. The Sloan Foundation awarded two additional grants to advance synthesis of deep carbon science. The first was to Adrian Jones (University College London, UK) on catastrophic perturbations to Earth’s deep carbon, which addresses a gap in DCO’s research portfolio. The second award went to Sabin Zahirovic and Dietmar Müller (EarthByte Group, University of Sydney, Australia) on the deep carbon cycle through geological time, which will provide an interdisciplinary synthesis of the carbon cycle in Earth’s lithosphere-biosphere system. This project is already off to a fast start with a session on “4D carbon cycle: a global interdisciplinary evaluation through space and time” at the 2018 European Geoscience Union (EGU) General Assembly in Vienna, Austria. The deadline for abstracts is 10 January 2018. 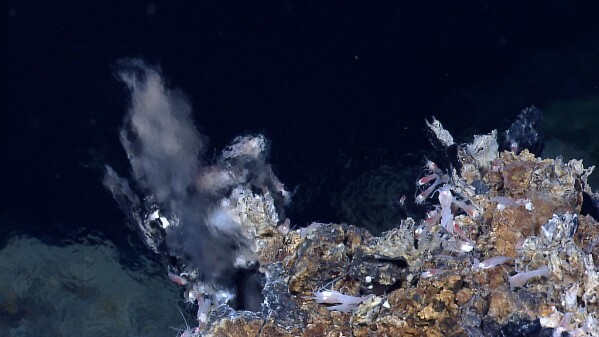 On the science front, DCO researchers have elucidated evolutionary processes occurring within some of the deepest known hydrothermal vents in the seafloor. Deep Life Community members Rika Anderson, (Carleton College, USA), Julie Huber (Woods Hole Oceanographic Institution, USA), and Julie Reveillaud (CIRAD, France), and Deep Energy Community members Jill McDermott (University of Toronto, Canada) and Jeffrey Seewald (Woods Hole Oceanographic Institution, USA) determined that two adjacent, but geochemically distinct hydrothermal vents, are experiencing different evolutionary pressures due to challenges in their environments that affect how the microbes evolve. A DCO instrumentation project has led to an important discovery about Earth’s atmosphere. Using the Panorama mass spectrometer, Laurence Yeung (Rice University, USA) and colleagues discovered extreme enrichment in atmospheric 15N15N, which they attribute to a planetary-scale balance of biogeochemical and atmospheric nitrogen chemistry. Also, congratulations are in order for Donald Dingwell, who was elected as a fellow of the American Association for the Advancement of Science, and Robert Hazen, who was awarded Honorary Membership in the Russian Mineralogical Society. Finally, we are grateful to all of the members of the DCO Science Network who investigate the mysteries of deep carbon, many of whom will present their latest work at the AGU Fall Meeting in New Orleans 11-15 December 2017. We look forward to seeing you there! A large contingent of DCO researchers will participate in the AGU Fall Meeting on 11-15 December 2017 in New Orleans, USA. This day-by-day listing will help you find sessions, talks, and posters of interest to DCO scientists, as well as those featuring members of the DCO Science Network. To add items to these listings, please contact the DCO Engagement Team. Sign up for daily email updates during the meeting here. Join DCO and C-DEBI for a poster swarm on Monday 11 December during session B11G (10am, New Orleans Ernest N Morial Convention Center–Poster Hall D-F). AGU’s Fall Meeting is the largest Earth and space science meeting in the world. This is a day-by-day guide to DCO talks and posters. The school will provide a general overview of recent advances in diamond research, combining geology, exploration, and gemology of diamond. Through keynote talks, panel discussions, and breakout sessions, invited participants will agree upon the five most important and relevant reactions that impact deep carbon science. The Marine Chemistry and Geochemistry Department at Woods Hole Oceanographic Institution is searching for two Postdoctoral Investigators to join their team. These are temporary positions and the initial appointment will be for one year (available immediately) with the possibility of an extension for up to two years. These positions will work in Julie Huber's laboratory. Huber's research focuses on the composition and function of microbes in the deep sea to understand microbial dynamics and the resulting biogeochemical implications. Much of her work has involved the ocean crustal aquifer (e.g., hydrothermal systems; ocean ridge and arc volcanoes; and off-ridge sub-seafloor crust). More broadly, her research interests span from the deep sea to coastal ponds and astrobiology. The postdoctoral investigator positions will participate in studies of subseafloor crustal microbial communities. While the primary focus of the work will be in research, the postdoctoral investigator will have an opportunity to participate in educational and outreach activities associated with the project. The Geophysical Laboratory of the Carnegie Institution for Science invites applications for postdoctoral fellowships. The Geophysical Laboratory emphasizes interdisciplinary experimental and theoretical research in fields ranging from geoscience, microbiology, chemistry, to physics. The Laboratory supports world-class facilities in high-pressure research, organic, stable isotope and biogeochemistry, mineral physics and petrology, and astrobiology. Carnegie Postdoctoral Fellowships are awarded once a year. The deadline for submitting an application is 1 December 2017 and the position begins the following summer or autumn. The Department of Geology at the University of Maryland invites applications for a tenure-track assistant professor in Earth Materials. Research areas of interest include, but are not limited to: experimental and theoretical aspects of petrology, mineral physics, nanogeoscience, and economic geology. The appointee will be expected to develop and maintain an active, externally funded research program that will involve both graduate and undergraduate students, and to participate fully in teaching at all levels, including mineralogy. We particularly encourage applications from those who integrate across traditional disciplinary boundaries within the Department of Geology, throughout the College of Computer, Mathematics, and Natural Sciences, and area governmental and private entities. Review of applications will begin in December 2017, and will be ongoing until the position is filled. Please consider applying to study as a PhD student for a newly funded project looking at water diffusion in mantle materials associated with melt channelling and veining in mantle ophiolite sections. This PhD opportunity at the University of Auckland, New Zealand, will require both field work (New Zealand and USA) and extensive geochemical and petrologic work, with the applicant starting as soon as possible to make use of the southern hemisphere summer. 27 November 2017: Volcanic eruptions are incredibly hard to predict. Here's why.